What factors affect calories burned and weight loss? How many calories does biking burn? Calories Burned Biking Calculator may satisfy your curiosity for how many calories biking burn. Whether you are a recreational cyclist, a bike commuter or a professional, you can calculate calories and kilograms lost while riding a bike. If you want to know how other sports and activities help in losing weight, check our calories burned calculator. A calorie is a unit of energy. It is defined as the approximate amount of energy needed to raise the temperature of one gram of water by one degree Celsius at a pressure of one atmosphere. One calorie (cal) is a really small amount, so in everyday life we use kilocalories (kcal), which is one thousand of calories. In this article, we use the term "calories" to describe kilocalories, which is quite a common practice. To calculate the calories burned, we need to know how to assess intensity and evaluate choice of the exercise. That's where the units METs appear. METs (Metabolic Equivalent of Task) are expressing the energy cost of physical activities. Simply, they measure how many calories you burn per hour of activity and per one kilogram of body weight. For example, MET for leisure biking is equal to 4, and the value for somebody taking part in a race and cycling over 20mph can be as high as 16. Therefore, choosing only the type of activity is not enough - in other calculators, you can usually find the one MET value for biking equal to 8 or 8.5, which is an averaged value for all types of cycling. where T is the duration of activity in hours, W is your weight in kilograms, and MET is a metabolic equivalent of the chosen task. If you want to check what other advantages of cycling are, have a look on biking life gain and car vs bike calculator. Choose the type of biking you are considering, e.g., bicycling 12-13.9 mph leisure, with moderate effort. Enter your weight into the calories burned biking calculator. Let's assume it's 80 kg. Next, determine the duration of the activity. Let's say you went for a half-day trip and were biking for 5 hours. Repeat the steps for second activity, changing only the form and duration - the results for 1.5-hour stationary biking with a heavy load is 1323 kcal burned and 0.172 kg weight loss. Tadaaam! The calories burned biking calculator helped you figure out which form of biking is more profitable. If you want to take care of your weight more systematically, visit our BMR (Basal Metabolic Rate) calculator. It will tell you how many calories your body requires for maintaining its basic existence. With this knowledge, it will be easier to create a healthy and efficient diet plan. 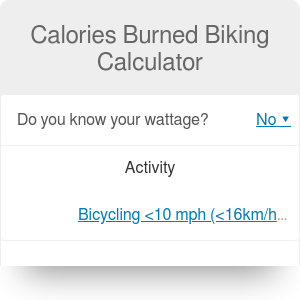 Calories Burned Biking Calculator can be embedded on your website to enrich the content you wrote and make it easier for your visitors to understand your message.